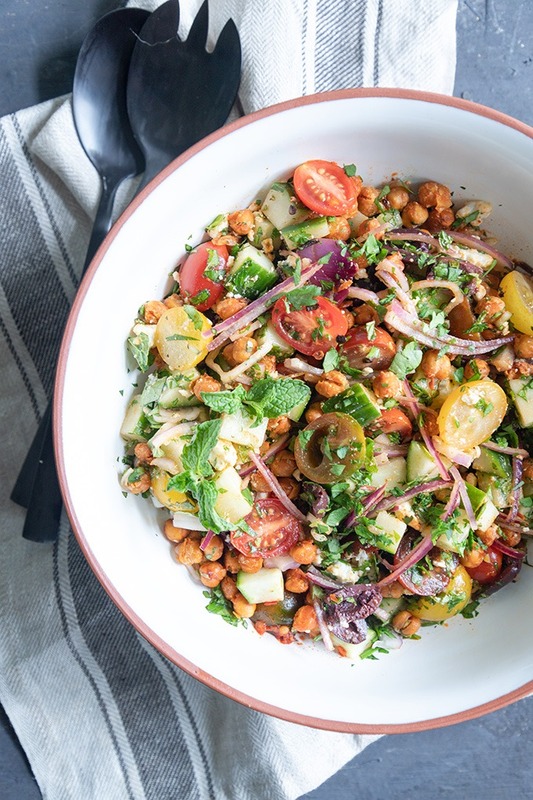 This Moroccan chickpea salad combines the fresh flavours of North Africa. 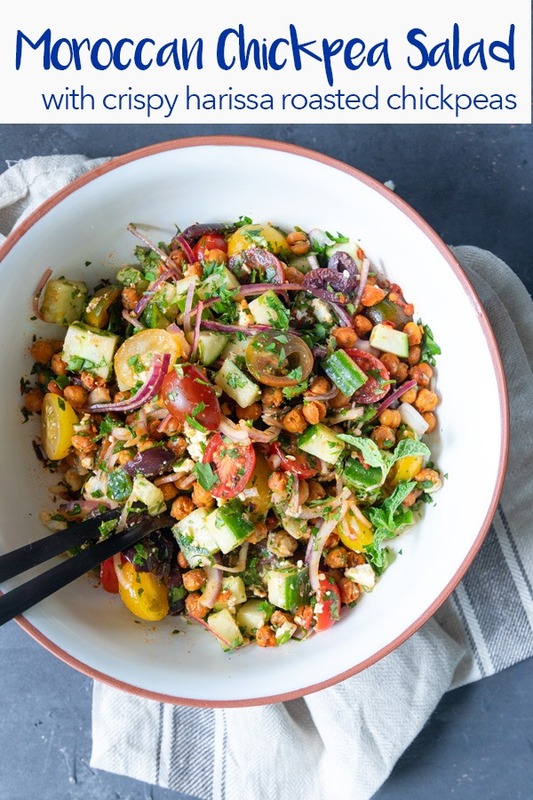 A healthy, light and fresh salad that has just a hint of spice from the crunchy harissa chickpeas. Topped with fresh herbs, this will be a new favourite for parties and gatherings! I have just a bit of an obsession with harissa at the HCK! If you’re not familiar with harissa, it’s a North African spice and it’s freaking delicious! I love adding harissa to different salads, or using it for a marinade in lamb or lamb tagine. I absolutely love this recipe, it’s super fresh and healthy, plus you have the added bonus of the super crispy, and crunchy chickpeas! This Moroccan chickpea salad does has a similar taste and texture to my Israeli couscous salad recipe if I’m honest, but I love the added texture from the crispy roasted chickpeas, and harissa does give off a spicier taste than the sumac used in the couscous salad! Both of these salads are hands down my favourite salads on the blog! This is undoubtedly the most important step in making this recipe amazing! The crunchy chickpeas provide the loveliest texture to the salad. I love crunchy salads that have a combination of flavours and textures. Make sure the chickpeas are rinsed well. Pat them dry with a paper towel, gently roughing them up. Some people remove the outer skins of the chickpeas, I actually prefer to keep them because they go super crispy. Roasting time is between 30-35 minutes, they will crisp up once they’re out of the oven, so don’t stress if they’re not super crunchy when you take them out of the oven. Every 10 minutes or so, gently shake the baking tray to move the chickpeas around so that they cook evenly. The key to getting a well-balanced salad comes with the chopping of the vegetables, and the type of vegetables you use. Tomatoes – I love using the small cherry tomatoes. Marinading them in the harissa and lemon juice really bring out the flavour of the tomato and the harissa spice. Cucumbers – I can’t for the love of me find them here, but my usual go-to cucumbers are the little Lebanese/Persian cucumbers. They’re sweeter than the usual continental cucumbers. I find the big thick cucumbers to be really bitter, which is why I love the smaller Lebanese cucumbers, but if you can find them, go for the longer English cucumbers. Red Onion – this needs to be very, very finely sliced! No one wants mad onion breath! Herbs – like the red onion, herbs should be finely chopped. This salad taste’s much better when everything is finely chopped. 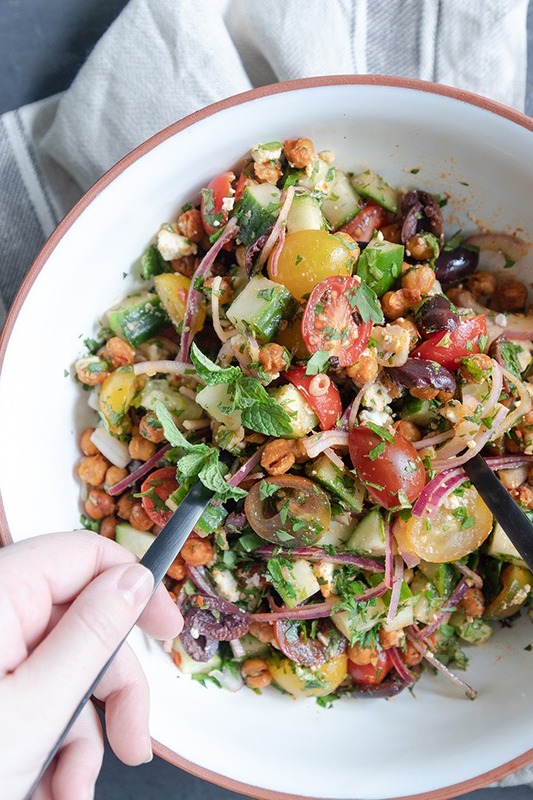 There is no real need to dress this salad, as the flavours come from the marinated tomatoes, and the spice from the chickpeas, but I do love to add just a drizzle of olive oil over the salad and just an extra squeeze of lemon juice! This salad would be so great for backyard parties, potluck gatherings, picnics, barbecues, Christmas or Thanksgiving or any other special occasion. I love pairing it with steak or sausages, or barbecued salmon and prawns! 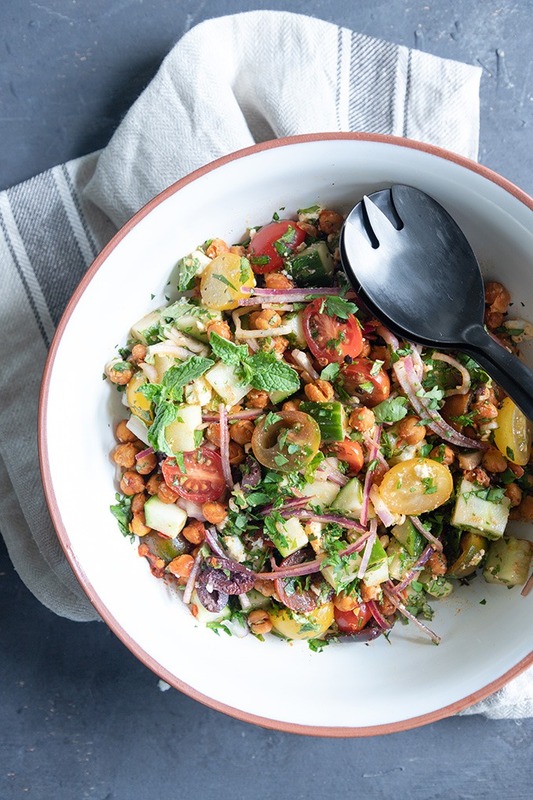 A fresh, hearty and healthy chickpea salad made with roasted harissa chickpeas. I love this easy recipe, and love the flavours from the fresh vegetables. This is a super simple Moroccan Chickpea Salad bringing the flavours of Morocco into your home! Drain, rinse and strain chickpeas. Pat dry with a piece of paper towel. Combine chickpeas, olive oil, harissa and salt and pepper. Mix well. Evenly lay out chickpeas onto a lined baking tray, and bake until golden and crunchy - about 30 minutes. Shake the baking tray every 10 minutes or so to ensure even cooking. Place halved tomatoes in a salad bowl with the lemon juice, salt and pepper and 1/2 teaspoon of harissa. Leave to marinade until chickpeas are done. Once chickpeas are cooled, combine cucumber, red onion, and chickpeas with the tomatoes. Top with olives, feta and herbs and a drizzle of olive oil. Crunchy harissa roasted chickpeas – great for snacking! Harissa baked eggs – perfect brunch for two. North African Shakshuka – breakfast or dinner idea! North African Potato Salad – so light and fresh for a potato salad. Harissa is my fav! So good and always have a jar on hand!! It’s a great way to quickly add flavor! How good is it!! totally my new favourite spice, although I feel like I’ve over done it a bit lately!!! I love salads, but I haven’t tried this one! Can’t wait to prepare it! thanks Maria, it’s a great family recipe! If you wanted it not so spicy, add less harissa!